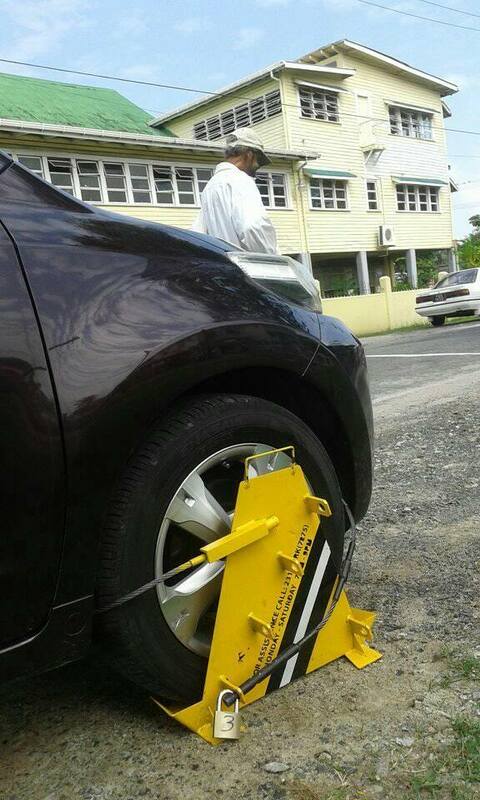 A vehicle clamped outside The Bishops’ High School in Georgetown. Coen Jackson photo. A series of changes on the parking meter regime were presented to the press corps today by Smart City Solutions, and the City Council. Those include a new system of paying by license plate instead of space, fee reductions, and a change in enforcement measures. It is believed these measures would only take effect after the new by-laws are placed before the City Council, which Town Clerk Royston King said, today, could take between seven to ten days. Georgetown Mayor Patricia Chase-Green announced, today, the parking meter project will resume as of monday, February 20. Motorists were told last week that clamping of vehicles would be halted until consultations were held with the public. “Motorists may purchase any amount of parking time and then move from any metered parking space to any other metered parking space anywhere in the City for the amount of time purchased on a single parking ticket until its expiry,” the document, presented to the press corps, read. As it relates to metered parking fees, motorists purchasing parking for 8 hours or more would see a reduction of their rate by 50% to $25 per 15 minutes. “The metered parking fee for all motorists that purchase parking for 8 hours or more will be reduced by 50% to $25 per 15 minutes plus VAT,” the statement read. “Any motorist paying for 4 hours of metered parking (at the current rate of $50 per 15 minutes plus VAT) will automatically be credited with 8 hours of metered parking,” the statement added. “During this one month adjustment period,” the statement continued, “vehicles that are immobilised for non-payment of metered parking fees will be required to pay only the metered parking fee for such time that they were immobilised, and nothing else.” That means if a vehicle has exceed its time for 20 minutes, the vehicle would be clamped, and the motorist would have to pay for that 20 minutes. Smart City Solutions, after the one-month grace period of not charging the clamping penalty, will re-introduce the penalty for 6 months at 50%. This means motorists would be charged $4,000 + Value Added Tax (VAT), if their vehicle is clamped. It was not clear whether the fee would be hiked to $8,000+VAT after the 6 month period ended, or whether there would be a review of the rate. As part of a range of special considerations, the company is allowing for businesses to apply for monthly parking permits, which would be considered on a case by case basis. Businesses may also apply for utilising the metered parking space for loading and off-loading cargo. “We will be operating under the rules of the by-laws as of monday,” SCS’s Business Director, Amir Oren, told the press corps today, as Georgetown Mayor, Patricia Chase-Green, announced today the project will resume as of Monday.